Today is a lucky day. I'm the featured author at Teri Polen's blog called Bad Moon Rising. 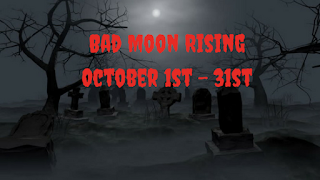 See what I have to say about Halloween and my latest book Curses. Just click right here to be transported away. It's also a lucky day because CURSES IS FREE just because it's a Bad Moon kind of day. Download your FREE Kindle copy at Amazon. This offer is good Oct. 18 - 22, 2017. Curses is one of those books that you come to the end and think "Now that was fun!" Wildly entertaining! Edge of your seat suspense and laugh out loud humor. Highly recommend. 5 stars. A riveting compilation of one ghost-hunt after another. Very entertaining!